A splendid night was had at the Beaufort to celebrate ‘Robert Louis Burns Night’ when 60 plus people turned up to enjoy haggis, neeps and tatties. Chairman of the Long John Silver Trust William Fairney brilliantly did the address to the haggis as you can see above. 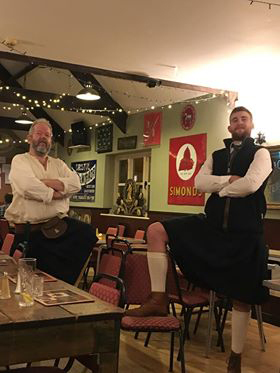 Mark and Tom comparing kiltsHawkesbury historian Barrie Hope did his very funny toast to the lassies and LJST stalwart Tess Green gamely did the reply – she had no warning that she would be called upon – and was superb. Many thanks to all who made it such a fun night, from the staff to the sonnsie faces. £155 was raised for the Long John Silver Trust to help them cover the costs of maintaining the Treasure Island Trail in Bristol.